The project is divided into four ‘work packages’ (WPs). WP1 will develop relationships between sediment structure and resistance to erosive forces. WP2 will relate subsurface structure to the nature of the vegetation present. WP3 will map sediment and vegetation types from the air (Umanned Aerial Vehicles (UAVs) and from space (satellites). 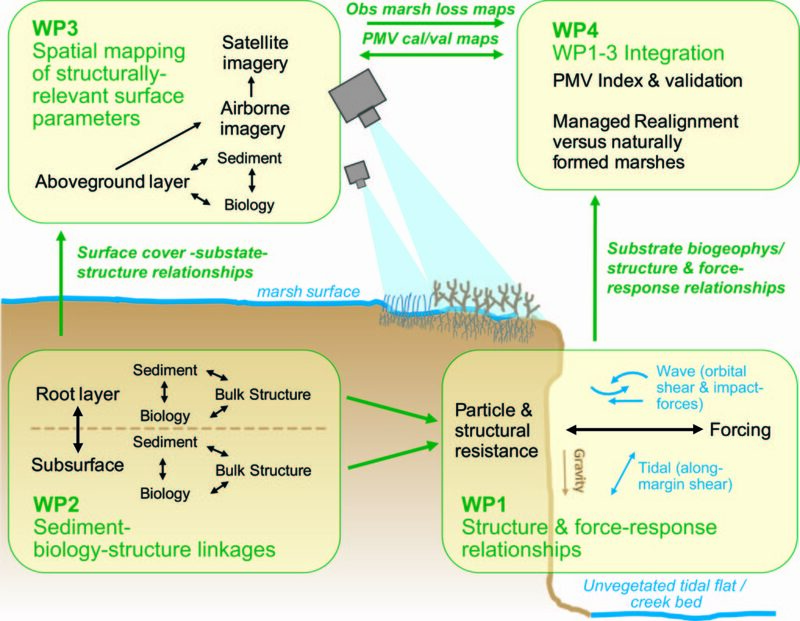 The combination of that understanding arising from the project as a whole (WP4) will allow us to map the susceptibility of marshes to erosion over large areas and to develop a Physical Marsh Vulnerability Index (PMV). The PMV will represent a step-change in our knowledge base and resources for the more sustainable management of these critical ecosystems.